Have you been there? Your child, the beautiful, seemingly innocent baby grew up a couple years and at this moment in time isn’t at all who you had thought they’d grow up to be. Your little blessing is standing before you acting in a way that you don’t allow, and trying to control. You’re doing your best, trying not to let their actions bring on the wrong response or reaction. You’re totally that mom, that before were a mom, you said you’d never be… yeah…it’s happening… it’s going down. There you stand, sit, kneel, trying to restrain, calm down, and diffuse the situation while you’re asking God for wisdom. Trying to remain composed and exhibit the self-controlled disposition you may feel like you’re constantly rehearsing with those sweet little face that you’re trying really hard to show love to. At the same time, you’re trying to not allow the embarrassment of what they are saying or doing to impact how you treat them or impact how you feel. You see, as I am trying right alongside you, is that’s exactly what’s so beautiful about God’s grace. In the moments of our weakness when we fall, when the mommy monster lashes out, when we are being ugly in our attitude or spirit, His beauty, His goodness, His grace- the free unmerited, undeserved favor of God- is right there. After all, isn’t that the beauty of the gospel? Jesus came to save sinners, to do what we couldn’t, to be the good we desire to be but can’t without Him. Be encouraged today beautiful Momma, you are unimaginably loved on your amazing days and on the days when you would do anything for a do-over. In those moments –good or bad– you can be confident in God’s love for you!! His grace is a beautiful gift that can turn the worse days into a beautiful reminder of the gift we have in Jesus!! His grace is waiting… do you need some today it’s yours for the asking??!! Lord, help us to walk there this week! https://thepricelessjourney.org/wp-content/uploads/2018/01/Thats-My-Girl-Blog-art.png 315 560 Ivory Granger https://thepricelessjourney.org/wp-content/uploads/2017/09/the-priceless-journey-logo.png Ivory Granger2018-01-02 22:28:292018-01-16 23:52:49When Jesus Says, "That's My Girl"
I love being a mom of two boys, but at times it’s tough to think that I’m basically working myself out of a job. My job is to help them be strong, independent, brave young men. My goal is to teach them to follow the Lord with all their heart, soul, and strength. I want them to need Jesus more then they need me. I want the Holy Spirit to be their constant companion and I often pray that they will have such a sensitivity to Him that they can’t get away with anything. I won’t be able to go to those future spots they choose to go to. But the Holy Spirit will be in them when they surrender their lives to Jesus. That’s my prayer! They haven’t made that decision yet, but my hope is that they will never know a day without Jesus. I pray daily that God will capture their hearts at an early age and help them understand their need for a Savior. And that God will equip me to see and understand their natural bent in life, so that I can nurture them to use it wisely for God’s Kingdom purpose! So right now, I embrace their independence. Sure it drives me crazy when I’m trying to get somewhere and they take their sweet little time. But I want them to do it on their own. I want them to learn that they are independent and strong. Sometimes that means slowing down and giving them the time to stretch their muscles. They are still growing and they need patience from me as their mom. They need me to be loving and kind even when we are running late. In my heart, I try to keep in mind that I am raising future men not little boys. Little boys don’t last forever, but grown men do. Every word I speak to them, to encourage them in who they are and embrace their strengths will equip them for the future God has for them. Every time I slow down to let them stretch their independent muscles, I encourage them to be their own man. It’s so worth it! I love watching my little four year old Zion. He has had a slumber party at his cousin’s house and his grandparents house. He was so proud of himself and took great effort to let me know that I didn’t even need to walk him to the door. He had this. He was confident and that brought great joy to my heart! I love watching him bloom and become the man God has designed him to be. I think to myself, if he is this independent and confident at four years old, how confident will he be in his 20s, 30s, etc. I embrace the fact that I have the opportunity to raise a strong and independent man. It’s a gift and I’m thankful daily that God gave me this gift to unwrap. Please share with me your thoughts on this. How does it feel to be working yourself out of a job? Do you enjoy the growing independence you see in your children? How are you teaching them to make their moments count? I would love to hear your thoughts in a comment below. Dear Father God, please continue to teach me what it means to raise future men. May I embrace the beauty of the job You have entrusted to me and always look at it as a gift. I pray that my boys will grow up to be strong, independent, and brave men! May they be valiant warriors for Christ! And may I accept with grace what my role looks like in each season with them! These are difficult days! Now that can be an understatement for moms. LOL! We have many difficult days. Days we wonder what we did to ourselves and how we got here. You are not alone! I’ve been there and I’ve talked to many moms who are right there with us. But here’s the truth of it, these days are going to pass. They will not last forever! Whatever difficult thing you are facing right now, I promise and I guarantee that it has an expiration date! So what do we do in the meantime. How do we handle the crazy? How do we make the most of these moments that we have with our children? That is something I hope to share with you in the pages of my new book for moms. I invited 20 moms to join me in sharing the number one lesson they would want their children to learn before leaving home. You can hear my heart on this book and how it came together by clicking on the above radio interview. My prayer is that you will feel equipped to enjoy these days. That you will find joy in the mundane tasks and tackle the day’s difficulties with ease. My prayer is that we will become a community of moms who support one another and speak life to one another. Will you join me in this endeavor? Please share in a comment below how you are making the moments count in your home. I would love to hear what tricks work for you and your family. Let’s learn from each other and embrace this beautiful season of motherhood! 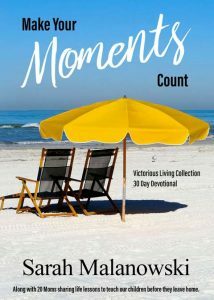 Buy my new book Make Your Moments Count to get geared up for the task at hand. It will encourage you. You will laugh with these moms, you will cry, and you will find the joy of being a mom once again. If you have already read the book, please consider leaving a review for it. I will send you a coupon code for a future purchase in the store when I receive your review! Lord, I pray that every mom who reads this book will feel encouraged and embrace the joy of motherhood. May we find Your grace to be big enough for the tough days that we face and more than anything may we point our children to Jesus! I know that often it can seem impossible to achieve the standard we see set forth in the Proverbs 31 woman, but let’s take a look at it from a mother’s perspective. How can we apply these verses to motherhood? I think we often overcomplicate this. This is not a set of rules to be obeyed. This is not a standard to achieve. We are the Proverbs 31 woman when we are surrendered to God’s purpose in our lives and live to please Him alone. I need to recognize that my primary role in the home is to be a supportive and loving wife. God gave me my marriage before He gave me my children. How can I better support the man that God has entrusted to me? Let me live out my days being a constant comfort and encouragement to the one God gave to me! May my words be pleasing in the sight of the Lord and may my attitude reflect a heart of thanksgiving for all that God has given me. Have you ever felt overwhelmed in motherhood? Have you had days where it feels like the waters of life are going to wash you away? I’ve been there! I know that feeling well. It’s amazing how quickly the enemy can take us from the mountain top to the desert by getting our focus on the seemingly unimportant details of life. I know for myself the times I feel overwhelmed are often the times I have taken my eyes off of Jesus. It happens when I haven’t spent enough time in God’s Word. It’s the times when I have spent more time focusing on the problem than the Problem Solver. Times when I have fixed my eyes on the broken pieces, instead of the Healer. Times when I have been fixated on my strength, instead of His strength in me. Yes, the overwhelming feeling comes. That is a guarantee! The enemy always wants to take our eyes off of God and get us fixated on ourselves. During the times we experience this, we need to redirect our thoughts right back to Scripture. We need to take the negative thoughts captive and make them obedient to Jesus Christ (2 Corinthians 10:5).